The author, after working with top management for more than 20 years in corporate America, has devised the 'Executive' Fraud Triangle, which helps describes the conditions that can propel privileged and selfish senior executives to commit fraud. However, after more than 20 years working in corporate America, I've devised a Fraud Triangle that works in addition to the traditional model to help us better understand those who sit at the apex of organizations. My employment positions have always been in support of — or on the same team as — senior management. During this time, top-level executives I worked with displayed nearly universally similar behaviors. These behaviors included lying, cheating, stealing, improper use of position to get around rules, dealing with people based on superior position or influence rather than performance, etc. According to the ACFE's 2014 Report to the Nations, "The higher the perpetrator's level of authority, the greater fraud losses tend to be." 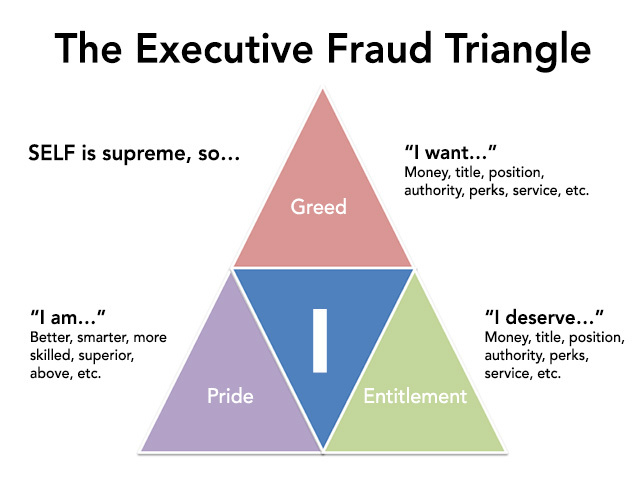 Using my previous experiences, I've developed a concept that stands on its own — the "Executive" Fraud Triangle. In this evolved Fraud Triangle, the possibly fraudulent executive stands alone at the center as the great "I" and is surrounded by three points: greed, pride and entitlement. Greed: Executives want money, position, title, authority, perks, services, etc. Pride: Executives think they're better, smarter, more skilled or superior. Entitled: Executives feel as though they deserve money, position, title, authority, perks, services, etc. Spend company money on frivolous items that have no business purpose. Hire friends or family and pay them large salaries. Hide spending in financial statements using improper reporting. Eliminate any voices of dissent. The executive is the top of the authority pile; he usually goes unchallenged or simply removes those that dare to question. Some behaviors are fraudulent. Others are an abuse of power. Misguided executives will lie or will cover up their behavior with lies. Others might simply be ignorant and arrogant. The question of whether an action constitutes an immoral or illegal act often rests upon the executive's requirement of fiduciary responsibility to the organization. He has a duty to protect and always act in the best interest of the organization for which he's responsible. 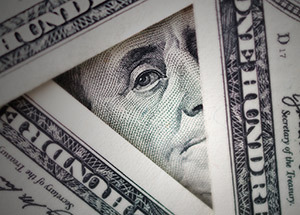 Greed is at the top of the Executive Fraud Triangle. (See the graphic below.) The executive wants for more and so will use his position and related authority to get it. For example, I've seen a CEO negotiate a blatant fraud with the board of directors of his company; if they voted to increase his pay and give him a large bonus, he'd increase their fee. The CEO hid the fraud by leaving this "negotiation" out of the meeting minutes and by burying the bonus in "Payroll Other" on the financial statements instead of "Bonus Expense." Pride is one of the supporting legs of the Executive Fraud Triangle. Executives that have too much pride, or an inflated sense of self, might think they're better, smarter, more skilled or superior to others. They won't allow anyone to question their decisions. Take the case of a CEO who felt he was smarter than the rest. He perpetrated a scheme in which he talked his company into giving him a piece of construction equipment for his personal farm. After many discussions, the company gave him a $25,000 motorized skid-steer loader as a gift. He never reported the value to the IRS and he improperly coded the value for reporting purposes. Did anyone push back? Yes, but they were subsequently fired. The last leg of the Executive Fraud Triangle is entitlement. Executives feel they deserve anything they could possibly want — money, fame, a bonus, a football-sized office, a gorgeous assistant. They should get these things because they "deserve" them. This level of selfishness can lead to all sorts of slimy decisions and behavior. For example, a CEO and CFO duo felt they each deserved a large office, private bathrooms, marble hallways and private glass elevators. To hide that they'd overspent on the capital expenditure project to fund these extravagances, the CFO instructed the corporate controller to change the board of director's reporting package. The corporate controller was directed to hide the $3.5 million overspending in a variance account on the financial statements — not into assets. Entitlement begets fraud. In another example, a CEO received reimbursement for executive classes at $5,000 a pop because "he deserved executive education." However, on the date of the classes, airline records showed that he and his girlfriend were in completely different cities for other reasons. On the first offense, the corporate controller brought it up to the CFO, and each of six times thereafter, but the CFO took the easy way out and silenced the voice of dissent. The controller was subsequently fired. The Fraud Triangle still best describes the conditions that can cause most employees to stray. However, the Executive Fraud Triangle delineates additional factors that are unique to highest management. Top selfish executives don't necessarily need opportunities to commit fraud — they create them. They feel no conviction to rationalize their actions because there isn't anything more important than the great "I." And the only pressure they feel is from inside to obtain more for "me." Barriers to fraud, such as conscience, character, faith, fear of detection, internal controls, and processes and procedures, are only that — barriers and not necessarily deterrents to top executives. Having witnessed much bad behavior and no punishment for it, I believe true fraud prevention comes with real punishment for crimes committed. As long as executives are driven by supreme selfishness, and if they act upon feelings of greed, pride or entitlement, fraudulent behavior will remain. Laura Wagoner Downing, CFE, owns a consulting business called Carpe Veritas ~ Pursue the Truth. Downing worked as a controller and cost accountant for more than 20 years in industries such as manufacturing of heavy equipment, printing & publishing, automotive, sales/marketing and nonprofit.